TAACCCT Grant developed guide for students on reading for information across a variety of contexts. The MediaSite video is hosted by TAACCCT team members Season Riley and Annie Hicks. 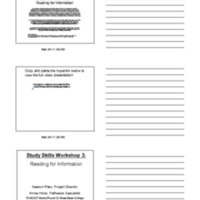 TAACCCT Grant, “Study Skills Workshop # 3: Reading for Information,” Digital Humanities of the Great Basin at Great Basin College, accessed April 25, 2019, https://humanities.gbcnv.edu/omeka/items/show/351.